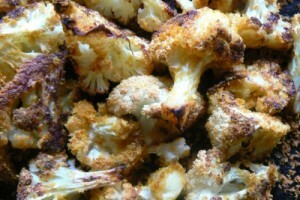 Combine cauliflower florets, oil and marjoram in a large bowl and season well. Place florets on a large baking sheet and bake in the oven until the florets start to soften and turn brown at the bottom (about 15 – 20 minutes). Remove from oven. Add the balsamic vinegar and toss well. Sprinkle with cheese and return to the oven. Roast for a further 5 to 10 minutes or until the cheese is melted. A delicious side dish that serves 4.